First you need to figure out your draw length, and there are two ways to do this at home without access to a bow. Ideally you should use both this method, as well as the arm-span method mentioned earlier, just for confirmation. If both methods give you slightly different results (for example 28 and 29 inches), simply add the two together and divide the result by 2 (two) to get the average, and use that as your draw length. What Arrow Length To Get? 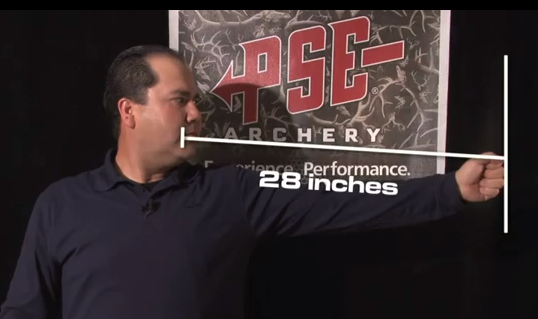 Once you’ve determined your draw length, simply add 1 to 2 inches to that, and this will be your ideal arrow length. So if your draw length is 28″, you should be using arrows that are between 29 and 30 inches long. 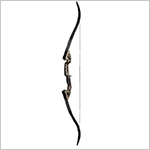 Bows with 40# to 70# draw weight: Allen Company 30-Inch Carbon Arrows with these broad-heads. Please note: while the arrows above are listed as being ranked for bows with 50# to 70# draw weight, they will work just fine with a 40# and 45# draw weight recurve as well. The goal of this guide isn’t to be a comprehensive tutorial on choosing arrows for a recurve bow. Rather, I want to give beginners an idea on what they should be buying. You could spend weeks upon weeks researching the most appropriate arrows for your recurve, and you would end up being more confused than you were at the beginning. I want to spare you all of that and simply give you some basic guidelines to follow as a novice archer – as you advance, you’ll be able to fine-tune your arrows (spine, diameter, etc.) to your particular needs. Suffice it to say that the most important difference is in total arrow weight. The heavier the arrow shaft, the deeper it will penetrate on impact (although it will also lose velocity faster) due to higher kinetic energy. When you are target practicing, you usually don’t need much penetration as you only want the arrow to pierce some compressed foam or cardboard. When hunting however, you might some times need to go through thick layers of fat and even bone. The good news is that none of this matters that much if you are a beginner, because you are likely not going to be shooting accurately at a distance of more than 20 or 30 yards. And within that distance range, a target arrow will do fairly well both for target practice as well as hunting, simply because this distance traveled is short enough that even a light arrow will still penetrate deeply both a foam target as well as flesh. Just make sure to get appropriate hunting broad heads as described above. There is of course much more to choosing the best arrows for your recurve bow than this. You could analyze fletching length and materials, different nock points, arrow weight, materials, diameter, etc.. My goal though, as stated in the intro, was to give you a really simple guide which can be used to dive right into archery, without having to spend countless hours researching the subject, only to later realize that the arrows you purchased were not ideal for your bow anyway. By following the guidelines on this page you can get your feet wet real quick with some good, quality, and universal arrows. Good luck, and if you have any questions feel free to contact me directly or post here in the comments below. Hey, awesome info. Just wanted to say that heavier arrows wouldn’t lose velocity faster just by being heavier. They wouldn’t gain as much velocity at the moment of being launched, but being heavier they would lose velocity slower assuming they had the same aerodynamic profile as a lighter arrow. They receive a lower initial velocity and lose their velocity slower (a property of having higher inertia thanks to increased mass). It is also this property of having a higher inertia that makes them penetrate more, as it requires more force to stop them. You are of course right, and I’ll make the appropriate adjustments to the article as soon as I have some free time. Thanks for pointing this out! 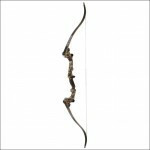 hey mark just had a quick question, what do you feel is the best arrow to purchase for the pse blackhawk 50″? It really depends on the shooter, what is the bow going to be used for, and even weather conditions in certain cases. I have a Mongolian recurve bow made from mahogany wood, I have a 34″ draw and was wondering what would be the best kind of fletching to have for hunting purposes. Have you heard of quick’s archery? I’m going there today to get parts for by Initech II Decathlon recurve bow, and i was wondering if they help get you the right arrows, and if so, would they fine tune the great information that you have posted? Thanks for the complete guide! One question. I just bought a used Fred Bear Hunter 60″ 45# draw. I ordered a Fast Flight string (56″). Is this string ok to use? Great info on your site! first, I’m super thankful for all the info that I’m finding here! 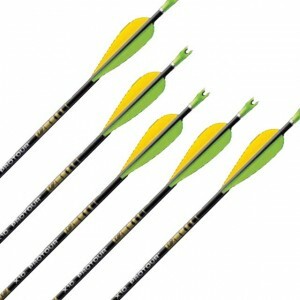 Next, I really want to get into archery and was wondering what’s a good amount of arrows to start with? 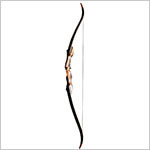 I have a browning wasp, 45# recurve bow… I also have straight cedar shafts to accompany it. My question is how to determine the proper tip weight and proper fetching (right helix, left helix, or centered) and proper knocks? Also I shoot a left handed bow, right handed. Thank you for this guide. I really appreciate it. My best friend just gifted me a 30lb recurve (what are friends for, right? hehe). He’ll be getting a 60lb because this bow is too easy for him now, but I am a beginner. 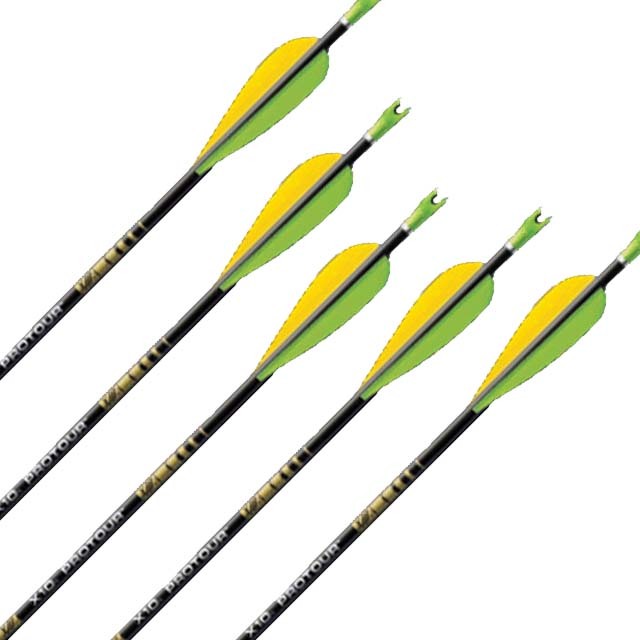 I am shopping around for arrows right now and just like you said in your guide, most peoples’ draw is 28”, so I’ll be buying 30” fiberglass arrows…can I ask what is the difference between fiberglass and carbon-fiber arrows? I assume for a beginner like me it won’t matter much. Thanks again. I have a southwest archery spider xl recurve bow. 45 lb draw weight and I’ve been shooting 31 inch prunus arrows. What should I be Using as far as arrows ? I am new to the sport and it turns out I’m a pretty good shot for a beginner. But I’d like to improve my shot . Any suggestions? Would you recommend using mechanical broadheads, such as Rage two blade hypodermics? What about arrows for longbows?